This virtual historic tour around the High Street Area of Christchurch will give an indication of some of the lost secrets of the town. The tour starts from the Saxon Square Car Park, which can be accessed from the Christchurch Bypass. By walking down the ramp from the upper level of the car park and turning left and walking to the open area of the square and looking right you will see the rear view of the first point of interest. Where Saxon Square now stands once stood Hookey’s House, believed to have been built in fourteenth century, but pulled down in 1972 to make way for the Square. The building was a medieval wooden frame cruck building. Samuel Hookey was known as the Wicked Man of Wick. He was born just across the River Stour and his first job was as a blacksmith’s apprentice at Pound Lane, which is visited at the end of this Virtual Tour. In the eighteenth century he became a successful smuggler and owner of three luggers which he kept in Christchurch Harbour. Luggers were double ended and shallow bottomed so cargoes could be unloaded directly onto beaches at low tide and the vessel floated off at high tide. Like many successful smugglers Hookey became a pillar of society and was Mayor several times. Hookey was supposed to have been drowned in the River Stour being weighed down by a body belt full of golden guineas for smuggling to France. This is a completely fake story, like many yarns, made up to entertain visitors and the name for a bar, called ‘Hookey’s Hole’, at a long gone holiday camp. 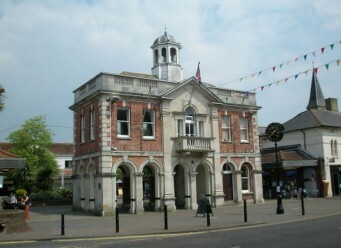 To one end of Saxon Square, built in 1992, is the Old Town Hall, which is now the Mayor’s Parlour. 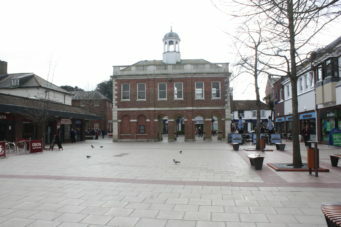 The Square replaced the 1902 Technical School which had housed the Council Chamber before the Civic Offices in Bridge Street were built in 1978. The original Market Cross may have been moved to Staple Cross on Burton Road during the plague of 1665, to enable money for food to be left in vinegar to pay for goods to be left in exchange. The Market Hall, or Old Town Hall, was built here in Blanchard’s Yard in 1859. However, this was not its first site. 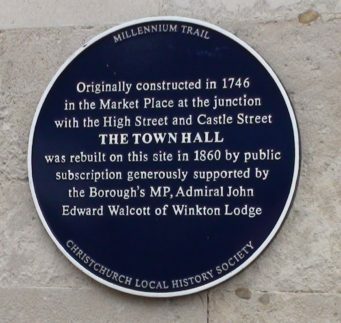 The Old Town Hall has occupied three sites, the first being on the corner of Millhams Street, which we will be visiting later, after which it was relocated to the the Market Square, the junction of High, Castle and Church Streets, which is visited on the Priory Area Historic Walk. Such halls developed from a Market Cross, which were eventually given a roof, like the Butter Cross at Salisbury. The roof would be used to hang fire fighting thatch rakes, fire brooms and buckets. Eventually the idea of a roof was developed to be a civic meeting room above the market and to give weather protection to some stalls. That is what we have here. Our market dates from Saxon times and is first mentioned in a Charter from the Earl of Devon in 1149. The Market Hall was built in the Market Square in 1745 and was moved to its present site at Blanchard’s Yard in the High Street in 1859. This was largely because of the increase in traffic which resulted from the railway, that reached Christchurch Road Railway Station in 1847. This is now the Holmsley Tea Rooms some seven miles from the town. The Market Hall at the Square only gave eleven feet clearance which was the cause of traffic jams for horse drawn coaches and wagons. Particularly after the arrival of the railway at Holmsley. The part of the ground floor of the Market Hall which is enclosed contains the stairs to the Mayor’s Parlour on the first floor. The area under the stairs was once the town jail, known as ‘The Blind House’, since it had no windows. This small lock up would have been used to accommodate noisy drunks overnight. The name stuck when a proper small jail was built on the Pit Site, now long gone to be a car park. Such small human pounds for short term detention still exist in some other parts of the world in lonely small villages. A lecture hall was added at the rear and became a venue for typical Victorian entertainments. For parliamentary elections a hustings was erected at the front of the building and votes were publicly cast which undoubtedly resulted in rowdy scenes. On the Christchurch Blue Plaques Millennium Trail Leaflet1 this location is identified as number 7. Walk to the front of the Old Town Hall and you will be standing in Christchurch High Street. After looking around turn left and proceed down to Millhams Street and you will see one of the redeveloped areas of this busy High Street. Just beyond the left turn into Millhams Street is The Ship Inn. The first mention of an early municipal building here is in a deed of 1572 concerning the tenant, a tanner named William Nutkyn, describing it as the ‘Old Tolsey’. No depiction of the earlier building has come to down to us unfortunately. 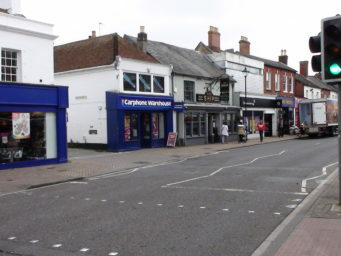 On the right at the top of Millhams Street on the High Street is a shop, occupied by The Carphone Warehouse, in a building which in 1572 was the Old Tolsey, meaning the old toll house for the market. The roof of the Old Tolsey is linked to the roof the The Ship Inn next door, no doubt a route for moving smuggled goods between the two buildings out of sight! 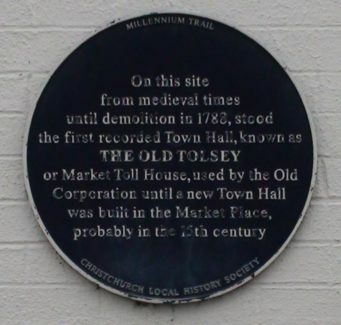 On the Christchurch Blue Plaques Millennium Trail Leaflet1 the Old Tolsey is identified as number 40. On the Christchurch Blue Plaques Millennium Trail Leaflet1 the Ship Inn is identified as number 39 but no Blue Plaque has been erected. Behind The Ship Inn facing onto Millhams Street was Cox’s, one of the town’s three fusee chain factories in 1789 to 1914. The building has been demolished but a Plaque has been erected in the entrance porch of the Superdrug shop.. 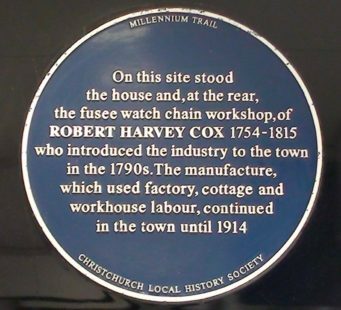 The fusee watch chain industry was concentrated on Christchurch from where these minute steel chains were exported as far as America. Some were so fine they could pass through the eye of a needle. Changes in the way watches are regulated caused its decline and end about a century ago. The Red House Museum contains a display of chains and chainmakers tools. The factories employed women and children whose small fingers could make the tiny chains for watches. They were often paupers from the Poor Houses at Christchurch and Milton. Eyesight suffered as a result and Pure Well and Tutton’s Wells were used for eye strain. They were clean wells since some distance outside the town. On the Christchurch Blue Plaques Millennium Trail Leaflet1 the site of Robert Cox’s House is identified as number 38.